I am back with the girls at the Sunderland Shipyard, welding their way through the Second World War. This is the third in the series of books and I recommend you read the previous two so you can understand the characters and background a lot more. Rosie is still in charge of this eclectic mix of women, but she is having troubles of her own. She knows that some of her past is behind her but it is her present which is causing the problems. Especially when it means she can no longer see the man, Peter she was walking out with. Peter on the other hand is prepared to find out the truth. Gloria, is back welding only a couple of weeks after giving birth to baby Hope. That takes some stamina and strength! But her life is not quite complete as her true love Jack is missing and Gloria may never know the real truth. Dorothy and Angie are the life and soul of the group, always ready to party and with a quick wit about them especially when it comes to chatting up men. But secretly they want what some of the other girls have, a stable relationship, just like Bel. A man on their arm and someone to love. Bel has finally decided to tie the knot with Joe. Although she feels the guilt of her dead husband, she knows that for herself and her little girl she must move forward and start living her life. Of course there are lots of other secondary characters but just as rich which are interwoven into the story, we get to learn more about Kate and of course the arrival of Maisie with secrets of her own makes for a page turning story. Every character is important and plays some role within the pages and brings the story very much to life. This saga keeps getting better and better, it deals with some important issues of the Second World War and how what was going on abroad affected those at home and how being at home also meant there were personal wars to be fought. I am looking forward to catching up with these women who feel like friends when the next book is released in 2018. 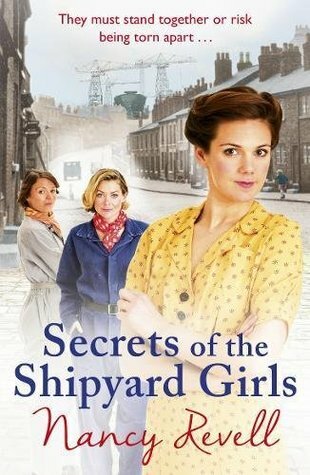 Secrets of the Shipyard Girls is out now.